What a great combination grill pan for your kitchen! 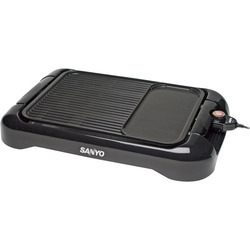 If you like traditional barbeque grilling but cannot cook outside, try this non-stick Sanyo Extra-Large 1300-Watt Indoor Barbeque Grill with Griddle. It combines a slotted grill section and a griddle section with lid, offers a drip pan to catch excess grease from cooking meats, and a stacking design for convernient storage__all beneficial features for indoor grilling. Extra-large size Allows indoor grilling of larger pieces and larger quantities of foods. Adjustable temperature control Provides a wide range of grilling temperatures up to 425ºF. Slotted grill plate Allows fat to drain away which provides for healthier eating. Non-stick grill surface Is double coated and easy to clean. Electric grill Plugs into outlet, does not require charcoal, gas, or propane. Hot surface Can sear foods like a traditional outdoor barbecue grill. Drip pan Is also nonstick coated and dishwasher safe. Handles and base Are cool to the touch. Stacking design Provides convenient storage for this indoor grill.